The Strip Display Management Test is an integral part of the selection process of air traffic controllers. Strip Display Management Test takes up the concept of ATC management by flight progress strips. In this approach of flight management ATC directs traffic via fixed control points (e.g. cities) and is able to detect evolving conflicts early. 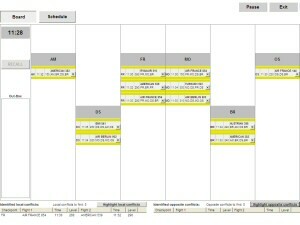 The training module allows for a realistic simulation of air traffic control by flight progress strips in various setups.